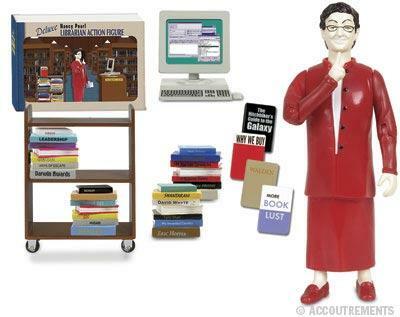 Librarian and iconic action figure Nancy Pearl was immortalized by Archie McPhee. Now they have updated her look and given her a computer. She is beginning to look more and more like me. As one of my students asked as I demonstrated her amazing "shushing" action, "Mrs. P., is that YOU?" Cute, Camille! I love these figures and Nancy Pearl is the best. She comes with a book cart and little books too? Excellent!